Moreton Bay is the front door water gardens of Brisbane. A short boat ride from Queensland’s capital city and you can experience reef diving to rival the great barrier reef and the best Artificial reef in Queensland. Here, there are more species and varieties of corals in this one area than any single one reef on the Great Barrier Reef. Ranging in depth from 5 to 25 metres and with visibility often better than 30 metres, this spot suits beginners to advanced divers. There are 10 hectares of magnificent coral gardens, and an interesting seascape with bommies of coral and swim-throughs. Intermingling with smaller coral growths are larger species of black coral bushes, beautiful red sea fans and many soft corals. These make a wonderful home and hiding place for hundreds of small, colourful tropical fish. Large schools of kingfish, mullet and sweetlip swoop in and around before disappearing again. Large grouper, manta and eagle rays are often seen. It’s as though a huge chunk of the Great Barrier Reef was cut off and transported to Moreton Bay. Simply stunning! The St. Paul sunk after coming to grief when it struck Smiths Rock. 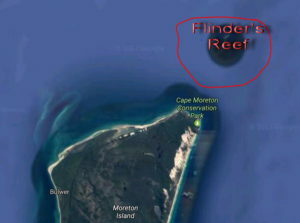 The wreck lies in 40 metres of water just off from Rock, near Flinders Reef. Here you will find a surprising amount of coral. There are soft corals, sea whips and a diversity of marine life. This is an advanced dive. The Underwater Research Group (URGO) has deliberately sunk more than 20 vessels over the last 21 years, to create the largest artificial reef in Queensland. The Reef contains a variety of craft that provides extremely interesting and diversified diving. There are a number of large ships, smaller boats, barges, pontoons, car bodies, pipes, a tram, dry dock gates and 2000 tyres of varying sizes. This has developed into a very successful ecosystem, with an array of corals and marine life occupying this area. Expect to see schools of kingfish and cobia, cod, grouper, moray eels and many tropicals here. Average visibility is 15 – 25 metres. The depth ranges from 15 – 28 metres, however with the average depth from 18 – 24 metres it is generally regarded as an advanced dive. 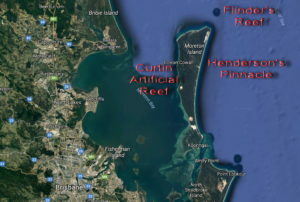 From Cape Moreton and south along the eastern coast of Moreton Island are an array of reefs and pinnacles. These all make excellent diving. Some care is required as flood and ebb tides can and do generate some strong currents. Best planned for slack water and high tide slack water has better visibility. Henderson’s Pinnacle is a particularly excellent dive site. Grey Nurse sharks are often seen in this location.